Sole reliance on the traditional centralized power grid as our main energy source is proving to be a fallible strategy. As natural disasters and cyber threats increasingly threaten the grid, blackouts are on the rise, causing catastrophic and costly consequences to communities, critical facilities and the economy at large. Microgrids – which can operate in parallel to the traditional grid or island independently – are transforming the energy industry. Microgrids are transforming our current utility-centric model to that of a hybrid and more distributed energy structure. This end user-centric approach s leads to fewer and shorter blackouts, cost savings, and less dependence on fossil fuels.  With the Encorp Egility control platform, you gain a truly modular and configurable approach to assembling and managing a microgrid – one that enables you to integrate and control multiple DER without the need for costly customized software. The result is a low cost, yet feature-rich solution that enables virtually any organization in need of resilient and sustainable energy to reap the immense benefits created by a microgrid that can be incrementally upgraded over time. Generators, Wind Turbines, Solar Power, Microturbines, Fuel Cells, etc. Encorp Egility enables developers and end-users to effectively integrate and optimize DER assets in order to deploy microgrids that both reduce costs and improve reliability. Encorp’s three computing platform Egility serves as the heart of the system. The GoEgility delivers the control architecture required to integrate DER (including solar photovoltaics (PV), wind turbines, and advanced battery-based storage devices, and the intelligence needed to balance these resources so that premium power is provided to customer loads in the most reliable and economical method possible. The one-of-a-kind Egility combines the modular functionality of several traditional control modules, protective relays and communication devices into a single, solid-state assembly to reduce troublesome network interfaces that have plagued the microgrid industry in the past due to incompatible and proprietary controls. This standardized, modular approach to execution dramatically reduces engineering and assembly time for paralleling switchgear applications, shortening deployment lead times to significantly less than what was the industry standard. According to a recent report from Navigant Research, global installations of microgrid capacity will grow from almost 2,700 megawatts (MW)in 2018 to more than over 15,800 MW in 2027. The expanding market has created keen competition, but as one of the oldest and most established players in the industry, Encorp is the company trusted by the many of the biggest movers and shakers including Tesla, E.ON, J.P. Morgan Chase, Verizon, the U.S. Navy and more. Our team of experts has over 200 years of combined experience with microgrid technology and is considered one of the best problem-solving technology integration teams in the world. Encorp is one of the only microgrid vendors in the industry focused on delivering microgrids to diverse clients ranging from military bases and utilities to small commercial entities of all shapes and sizes. Whether you are a large organization providing power and natural gas to millions of customers or a smaller scale operation running an eco-conscious resort on an isolated island, we have a solution for you. We listen to our customers carefully and develop microgrid solutions that can address their unique energy needs. We back up those solutions with 25-year legacy of design and implementation of customized energy solutions. We have helped more than 400 companies maximize the use of DER. Learn more about our most successful projects here .